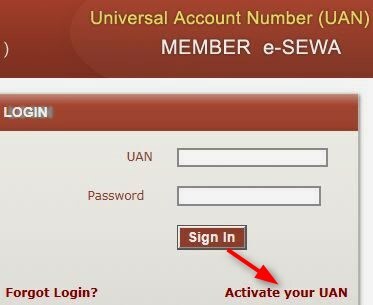 EPF UAN Login: How to Login at UAN Member Portal Online? EPF UAN login is not something to ignore for the EPFO members. Employees can not overlook UAN portal as all the EPFO services are now linked to it. A simple login into the UAN member portal gives countless benefits to the employees. Since we are sharing all the useful information related to PF, we could not stop sharing this too. UAN activation is a very simple online process. If you are yet to activate your UAN, use the information given in this post and activate it. The universal account number is launched to centralize all the multiple PF accounts of a person. It is also reducing an employee’s dependency on his/her employer for important PF related procedures. Earlier, employees were dependent on their companies for the PF related activities. PF account transfer, balance status, and withdrawal were impossible without the help of the employer. Things have changed and the employee has a greater control over his/her PF account. Hence, as a responsible employee, it is signification to gain friendliness with your UAN member portal. Learn to use your EPF UAN login and see how you can do multiple things saving lots of time and hassles. Let us start with activating UAN. This is the first step before you explore the benefits UAN portal offers you. To know your UAN number, contact your employer or check the UAN status. Once you have your universal account number, follow the procedure. Hit the below link of the UAN member portal. Use the option of ‘Activate your UAN’ at the homepage. Click the confirmation for instructions at the next page. Fill up the form by providing required details. You need to fill up your mobile number, member id number, and UAN number. Follow further procedures and get the PIN number to your mobile. Now type the PIN to get authorization. This will activate your EPF UAN login online at the UAN portal. Now get back to the homepage again and login using your UAN number and password. Be sure to use your valid mobile number and e-mail address during the process. You may update or change your mail address and mobile number later at this portal. As already stated, there are tons of benefits of UAN login. It will not be surprising if UAN will be mandatory in the near future due to the benefits linked to it. These are the foremost facilities that your EPF UAN login will provide you. Link your aadhar and other details with your UAN. EPF UAN login portal is the unified portal for employees. EPFO has also launched unified portal for employers with UAN. This helps in the submission of UAN based challans and returns by the employers. EPF UAN login facility is truly the gateway of countless benefits for the employees. As per new UAN login rules, the PF claim forms will be accepted without UAN only if the date of leaving the job is before 1st January 2014. Hence, it is high time for the employees to get the UAN activated. However, in exceptional cases, the claim forms will be accepted without UAN on the basis of merit. The decision will be on the officer at his discretion. Quoting universal account number on the EPF claim forms is made mandatory to reduce the chances of errors. Since UAN is seeded with aadhar, PAN and bank details, the claim process becomes hassle free and quick. For more information on UAN member portal, keep visiting our portal for more updates and information. Pingback: UAN Login: How to Register & Login to UAN Member Portal? how to register in the member portal. Not able to login using UAN & UAN Password. UAN NAME EDIT KARSKTE HAI.